When I did my latest Layla order from Italy, I decided to try some of the polishes from their regular line. I've seen both the holograms and magneffect polishes in store at Price Attack, but I've never seen their regular line, the Ceramic Effects. 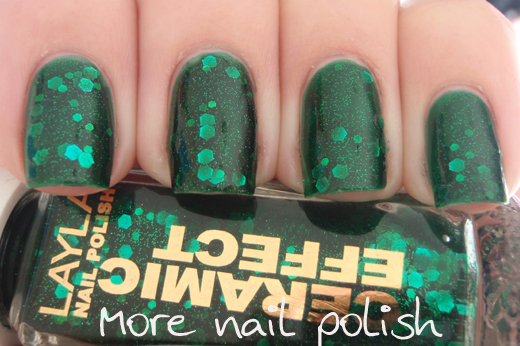 This one is a slightly newer release and it's called Green Galaxy. I can't tell you how much I love this and how many comments I received on it. Absolutely stunning. 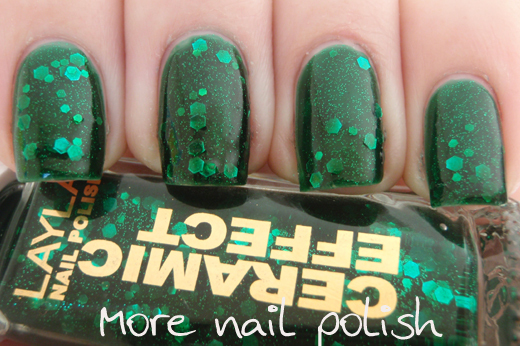 This is two coats of Green Galaxy topped with Seche Vite top coat. 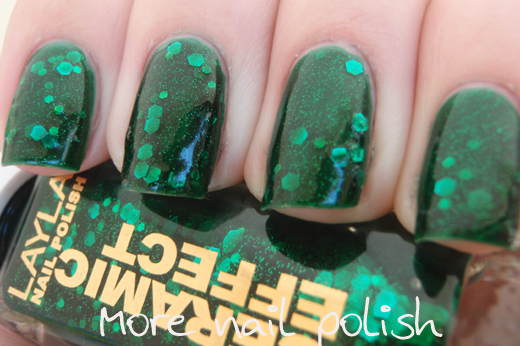 As you can see, this is a gorgeous dark green jelly polish with very fine square green glitter, and two sizes of green hex glitter. The formula was excellent, the brush was great and the wear was fantastic. WIN! I bought six ceramic effect polishes and I can't wait to try the others. I purchased directly from the Layla Cosmetics website and they cost €7.60. For anyone having trouble trying to register because of the TAX ID, I registered before that became a required field on the form (I get heaps of emails asking me that). If you have troubles registering you can try emailing them. Oh a lesser seen polish from Layla, and a very pretty one too! Stunning! It has sooo much depth. I don't like green but this looks good! Wow this is gorgeous! I want this so badly now! it is like a green version of nailventurous' flying blue jay! 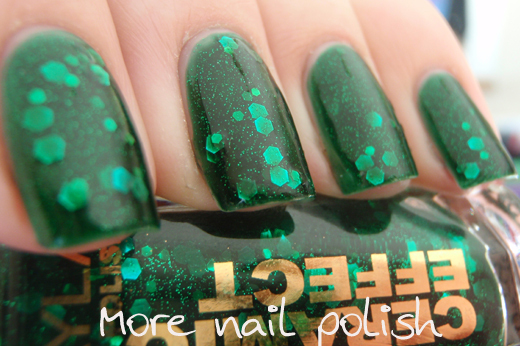 Maybe it's because of the name, but I think of Star Wars when I'm looking at these photos...) Awesome polish! I'm wearing this right now and I LOVE it! so so gorgeous! Wow, these Layla polishes are great! I'm going to have to track some down, must see moreeee!